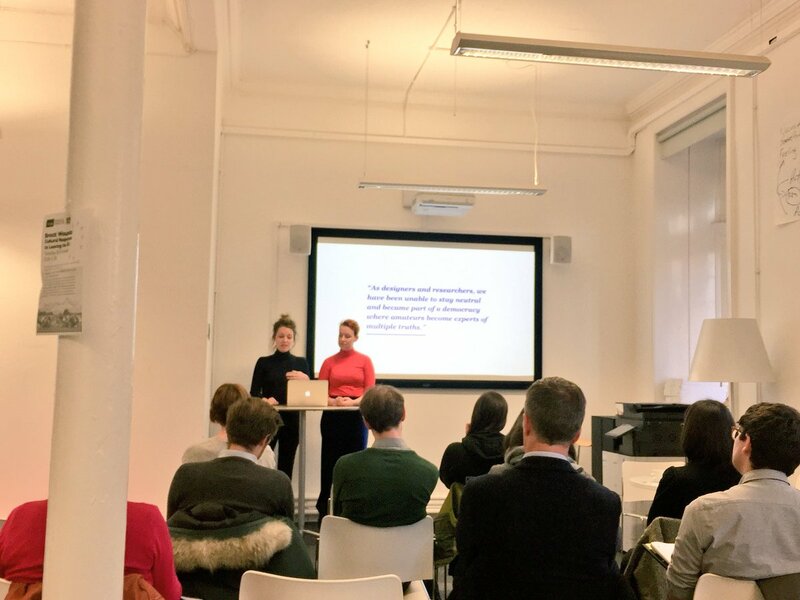 This week Anne and Lisa travelled to Manchester to speak at the symposium ‘Brexit Wounds: Cultural Responses to Leaving the EU’. Brexit Wounds took place at Manchester Metropolitan University and was a day full of very interesting lectures with different perspectives on the effects of Brexit. Most of the papers presented came from an academic perspective, which made it interesting to us as designers to present something a little different in this context. In the face of new technological, political and social forces, many traditional boundaries between people, things, ideas as well as places, seem to be collapsing. Often it seems we are losing grip on what could be our future and our individual responsibilities to be part of this future. What will be our identities, expectations and needs? Design stands in between such material and immaterial relations. Designers can play a unique role in answering these questions by facilitating debate, reflection, and transformative actions. Designers have always had a social and a political role, by defining our material world. In times of Brexit, this seems to become a more important responsibility: combining new knowledge, critical thinking, as well as consciousness and creativity to transform large scale issues on the basis of the real needs of the community – which is where human life happens. From the other speakers this day we learned again how complex Brexit is and the different ways of explaining how a Brexit situation could arise. Once again our motivation increased to actually go out and do something – rather than talking about it. We are very excited to come back to Manchester next month and get started on our plans for next year and create some transformative actions!